It’s been proven that web design with more visuals and graphics tend to be more effective than those without. Unfortunately, graphic design is more complicated than simply dropping photos or images onto a web page. Before you start changing your website’s graphics, be sure to check out these tips for implementing photos in your web page designs. Making sure to use images to capture an audience is important but so is not losing your clients due to slow load times because of poorly optimized images. Most users only wait around 3 seconds before leaving a webpage on desktop because of slow loading images and only 5 seconds on mobile devices. Follow these 3 tips to help ensure you don’t lose clients due to poor image optimization. Web pages are designed on a foundation of millions of pixels. This topic is just as important in graphic design and the choice and selection of photos, because if an image isn't designed to be large enough for the space it’s meant to occupy, in most cases it will look pixelated and lose image quality. When an image is too big for the space it's meant to occupy it can take add excess file size weight to a webpage slowing down load times for both desktop and mobile-users. It's possible to also over-optimize and make a image low quality in exchange for faster load times. It's therefore extremely important to optimize your photos correctly for the web. Visitors to your webpage are already very familiar with visiting a websites and perceiving whether a webpage is professional or assembled cheaply. When it comes to graphic design, your website visitors may recognize certain very commonly used stock images. If you don’t want your company to be interpreted as generic, we recommend avoiding using the most popular stock images or very generic looking images that visitors might already recognize because they are already used on thousands of other websites across the internet. This is a costlier solution to the problem mentioned above, but it will be well worth the investment. An investment in professional photography will draw the eye of your website’s visitors and create a stronger emotional connection to the written content on each page. Conversely, photos of poor quality or photographs that have little or nothing to do with the unique text content on each webpage is arguably worse than having no photos at all on a webpage. Take your time to get your website right. Ask for help from professionals when you need it. Optimized photos on the web give your online presence something more unique and memorable for visitors, and when done by a professional agency that does both web & graphic design it will usually increase your search engine rankings, or SEO, as well. If you need a trusted Las Vegas web design firm that takes graphic design seriously, look no further than All in Web Pro. Our experienced design team will work with you to find your brand’s voice and help you put it onto the page. If you are ready to take your brand to the next step, contact All in Web Pro today. All in Web Pro is a professional web design company located in Las Vegas. Our professional web design, graphic design, custom web development, and internet marketing solutions are perfect for any size business. We create the perfect online presence for our clients that exceeds industry standards and expectations. Our services include not only professional web design but complete website overhauls, graphic design, custom web application programming, and search engine optimization through our local SEO partner. No matter your needs, All in Web Pro will deliver a quality strategy that will redefine and energize how you do business online. When customers want to find a business, whether it's a local restaurant or a global retailer, the web is the first place they look. A professional web design can help you increase sales and expose your business to thousands of new clients. A professional web design not only makes it easy for customers to find your business on the web, but it also gives you a place where you can create your own unique online presence, from a full-blown web store to a simple online business card with your contact information, hours and location. All of our professional web designs are created from scratch to deliver an attractive, usable and sustainable online presence to help your brand capture and convert new business opportunities and deliver your message to potential customers. No matter what your business objectives, our professional web design experts can create the perfect website to engage customers and drive sales. Our goal is to give you a great website that will help your business grow. Once your website is complete, we can work on all of the other online aspects that help market your site and bring your company up to the top of search engines. Whether you are launching a new online store or you want to rebuild an existing one, we are here to help you every step of the way. So, what are you waiting for? 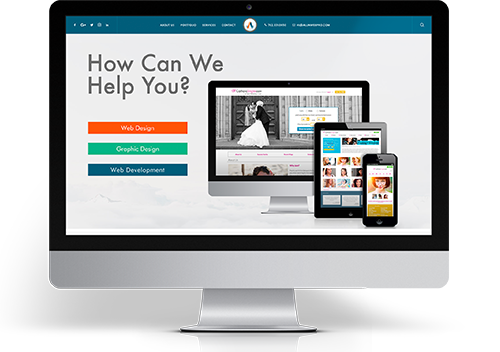 Contact All in Web Pro today and let us get started creating the professional web design you’ve always dreamed of. In 2016, having a professionally created web design is vital to having a properly running website that works well for visitors, search engines, and achieves your online goals. It’s been estimated that you only have a few seconds to make an impression on website visitors before they leave your page. If your web design does not grab their attention immediately, your visitors might not want to stick around for long. In fact, it's likely that very few visitors people will need to view more than a few pages of your site before making their decision whether to use your services. So, with those points in mind, let’s discuss some ways a professional web design can grab the attention of your website visitors. In a future article, we will discuss more how to keep visitor attention with great website content. It’s important to remember that most people spend their time on the internet reading. They read articles, how-to’s, news stories, forums and search results. A professional web design company, such as All in Web Pro in Las Vegas, will take this into account when designing your website. But, we’ll save that for later. Our first step is to grab the visitor’s attention. We live our day-to-day lives in a very fast-paced society and we’re used to getting instant results with everything we do. The internet is no different and it’s actually much less forgiving of websites that don’t deliver the results the visitors are looking for quickly. It’s important to remember that visitors will only stay on your site for a few seconds if they don’t see something that immediately grabs their attention or let’s them find the information they’re looking for. Try loading your website and ask yourself a few questions about what your visitor will see. How long does it take before anything is visible on the page? What is the first thing that shows up once the site has loaded? How much time passes before you see readable text? Is it immediately clear what the website is about? You can even ask some friends or family to try this to get a more thorough impression. Another important thing to consider, and one of the most overlooked aspects of web design, are graphics. It’s very common to visit a website and find that images load very slowly. This gives visitors another reason not to stick around on your website. Hiring a professional web design company like All in Web Pro will prevent bad design decisions like this from happening to you. In the meantime, taking advantage of appropriately sized and optimized JPEG, PNG, or GIF images will help reduce the file size and download time to help make your website load faster. In general, if your graphics have a lot of colors you should be using the JPEG image format and make sure the image is sized correctly so that the file size is not too large and prevents the rest of the website from loading slowly. If your graphics have only a few colors, it may be best to use GIF or PNG image file types. Either way, ensure you find a good balance between image quality and file size. Of course, there are many other factors to the role that graphics play in professional web design. If you hire a professional web design company to create your website, they should already follow these and other guidelines during the design process to ensure you're online presence is optimized and has its best foot forward. A 'call to action' is a term that web designers use to describe anything that requests that your website visitors take a specific action. This can be an offer statement in the form of text, an image, a button, or some element on a webpage that prompts visitors to do something. The action of clicking a button, clicking link or image, filling out a form, or performing some other third party related action such as sharing content to social media. Including a call to action can be an easy but important element in your website that can grab your visitors' attention and help achieve your specific conversion goals when done correctly with a professional web design provider. All in Web Pro is a professional web design company based in Las Vegas, Nevada. We not only specialize in web design but graphic design for print and web, custom web application development, and much more including helping set up your brand for search engine ranking success through the right SEO (search engine optimization) services.